And when I make it again, I’d use Swiss cheese. Not Feta. As part of making a little more room in the pantry and freezer, I have found myself rummaging through each every afternoon looking for something to concoct. Sometimes it’s an old recipe from the site, other times it’s using up the spaghetti sauce that I find. And this meal was a concoction. I found Feta in the freezer. Cooked turkey bacon in the freezer. Onions in the cupboard and a red pepper in the fridge. Throw it all together…a breakfast for dinner. Place the onion slices in a skillet over low heat with the olive oil and sugar. Cook over low heat, stirring often, for about 30 minutes to caramelize the onions. Whisk together the eggs and milk with some salt and pepper. Add about 1-2 Tbsp oil to a small skillet or omelet pan. Cook the omelet. Add the Feta, bacon and red pepper to the middle before folding over to serve. (Omelet How To Photos here). Slide the omelet onto the serving plate and top with caramelized onions and some salt and pepper to taste. 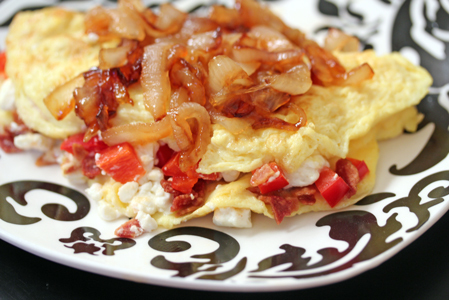 Serve Omelets with Caramelized Onions and Bacon with side of fresh fruit. I love breakfast for dinner and what a great way to clean out the freezer. yummm… this looks delicious! My family and I love breakfast for dinner as well. Thanks for sharing!